KuPP Oxford is a beautiful new Nordic-inspired dining venue atop the top floor of John Lewis, Oxford in the new and shiny (and very much improved) Westgate Shopping centre. You can also access it via a lift just to the left of the John Lewis store entrance. KuPP Oxford is bright and bold, with an edgy design and a gorgeous rooftop location. It has a quirky nature-meets-industrial feel, with revealed copper pipes, cosy faux fur lined or floral print seating, tree trunk features, potted plants and roped lighting decorating the interior. The optional outdoor seating presents the perfect summertime dining opportunity. Alas, on the final day of January, we were much better off in the warm interior of this beautiful restaurant. 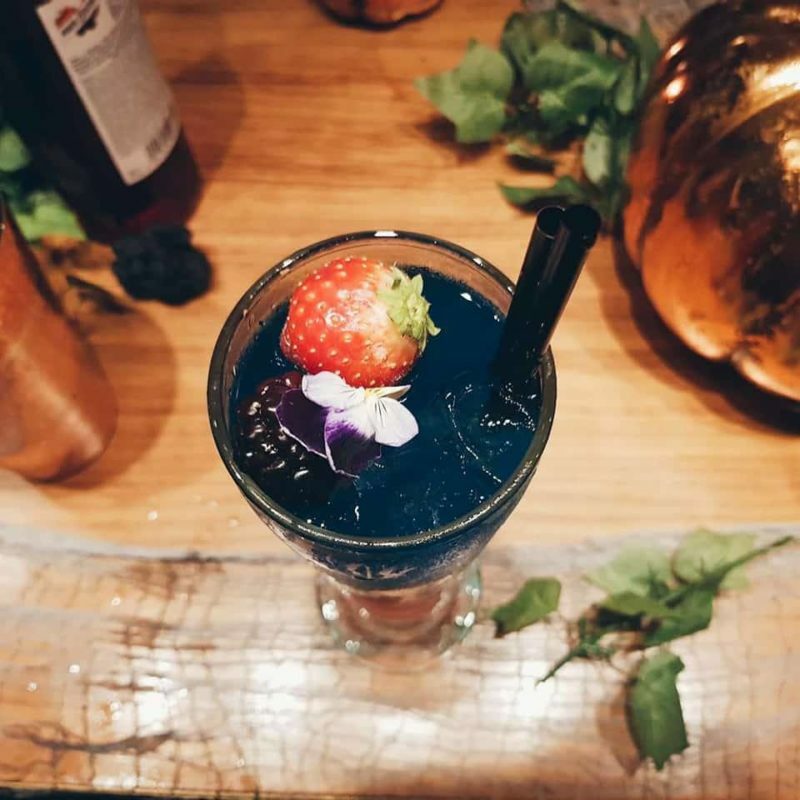 So, what did I think of KuPP Oxford? The restaurant offers Scandinavian cuisine morning, noon and night with a healthy and wholesome menu embellished with classic Nordic dishes and incredible cocktails infused with a variety of homemade syrups. 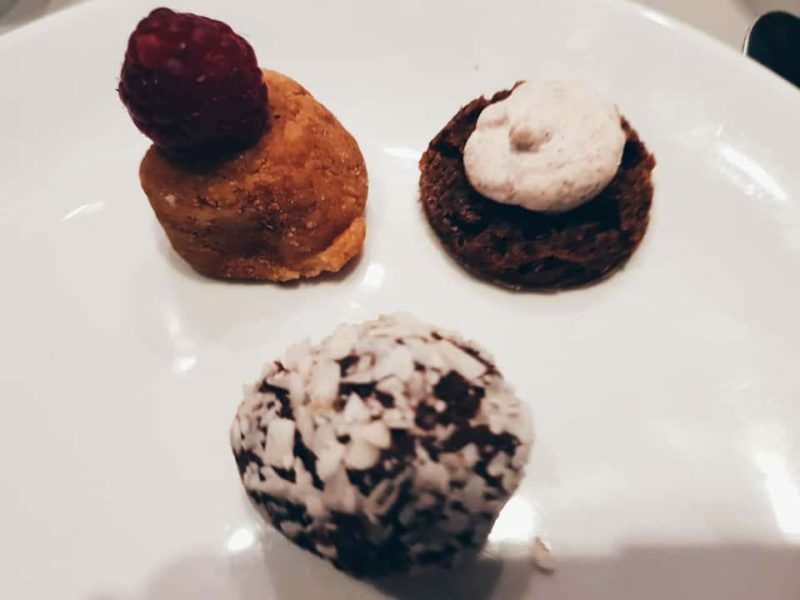 We were lucky enough to sample a variety of different starters, their famed smörgåsbords and indulgent mini deserts – order the cheesecake. I repeat, order the cheesecake! 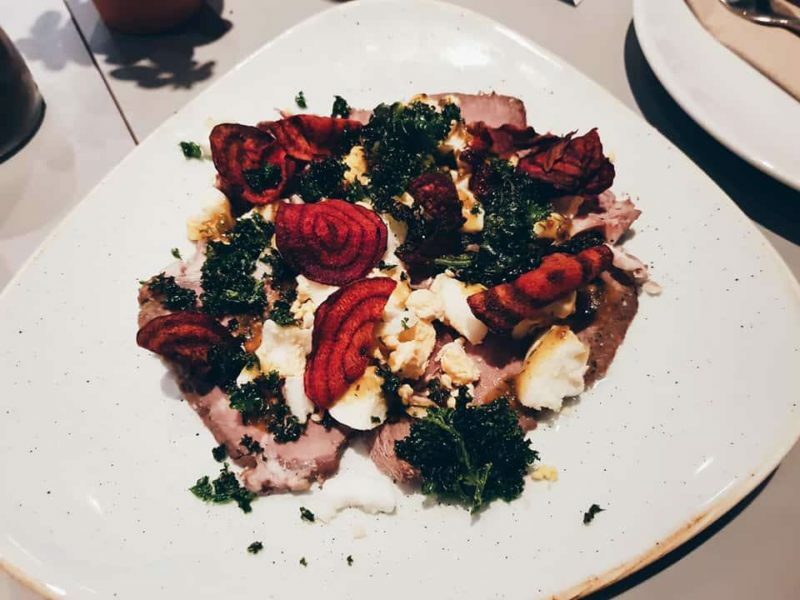 What I love about KuPP is that it encourages you to share and try new and interesting foods you may not otherwise have thought to. The smörgåsbords are simply so much fun, with a variety of nibbles to drag you in. As someone who is far too fussy with food, it really made me step out of my comfort zone, as I sampled an array of chicken and vegetarian dishes. The västerbotten cheese and pickled vegetables are simply to die for. 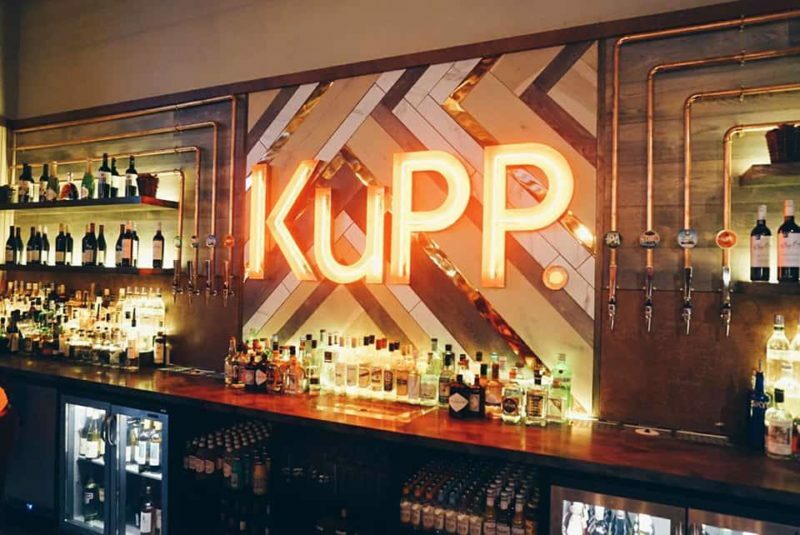 KuPP is perfect at any time of the day, be it breakfast, a simple coffee stop, brunch, evening meals or a quick cocktail. They even have a store onsite where you can purchase their delicious coffee, jams and even some Nordic home decor! Everything on their menu is fresh and bursting with flavour. It is truly refreshing and you can see the chefs, bartenders and waiters whizzing about hard at work perfecting the dishes and experience. 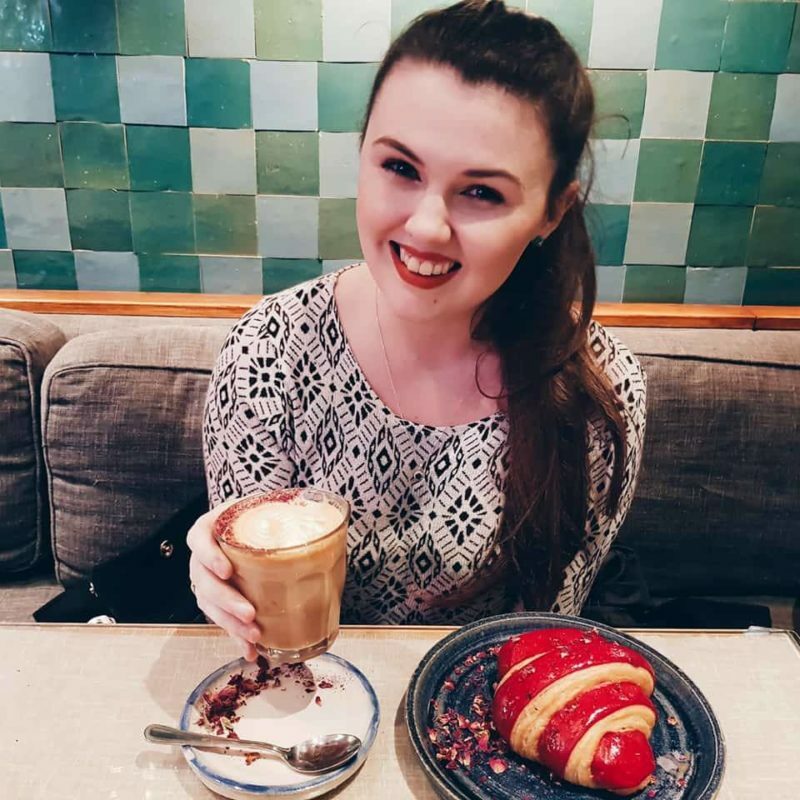 I will be returning to KuPP within the next week for brunch with my mother – I am fighting between the smoothie bowl and pancakes currently. I am sure I will have many more visits in the near future. 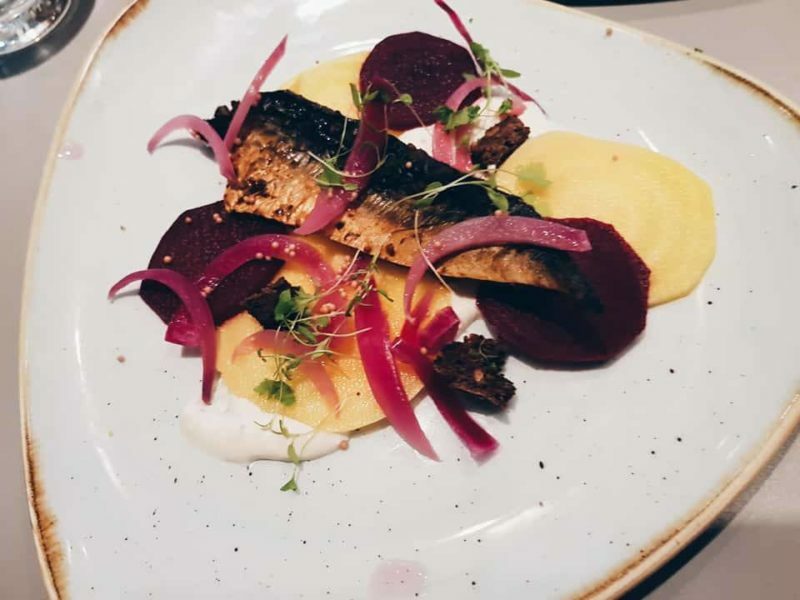 It is simple, if you are looking for incredible dining in the heart of Oxford, look no further than the oh so welcoming KuPP! 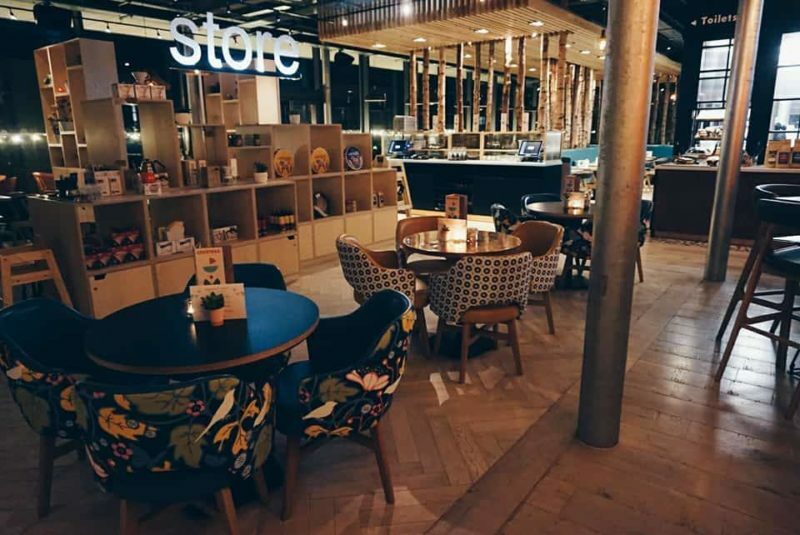 Have you been to KuPP Oxford yet? How about visiting the Westgate Oxford for a spot of shopping? 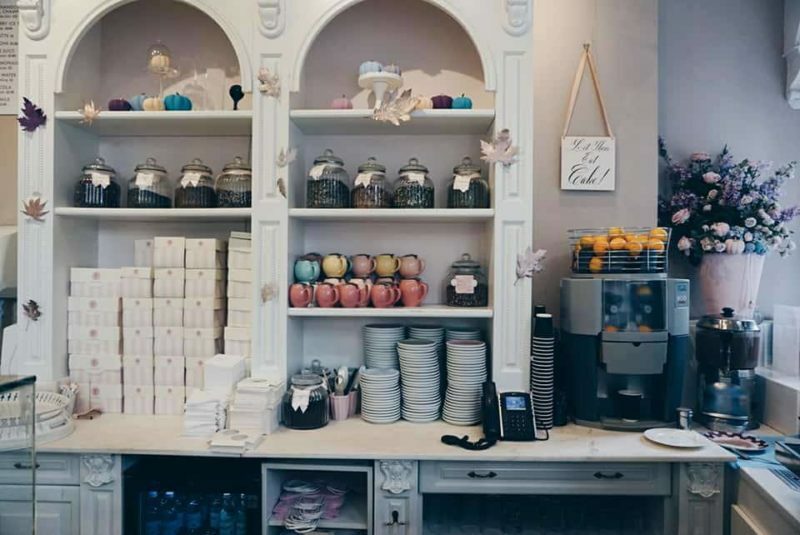 I have wanted to go to the Farm Girl for quite some time, drawn in by their colourful lattes, vibrant salads and quirky decor dotting across my Instagram feed – they also have a resident bulldog, just one more reason to go really. 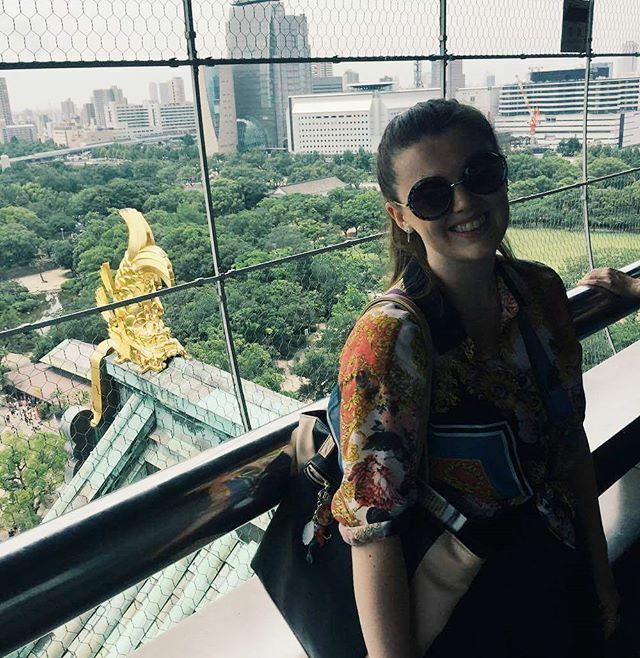 Located on Portobello Road in Notting Hill, it made for a nice brisk walk from the nearby tube station. Visiting on a busy Saturday afternoon, we had to wait some time (in the rain) before managing to secure a seat inside. Do be warned, if you come at the weekend, you may have to wait for up to an hour to be seated. However, it is worth it! 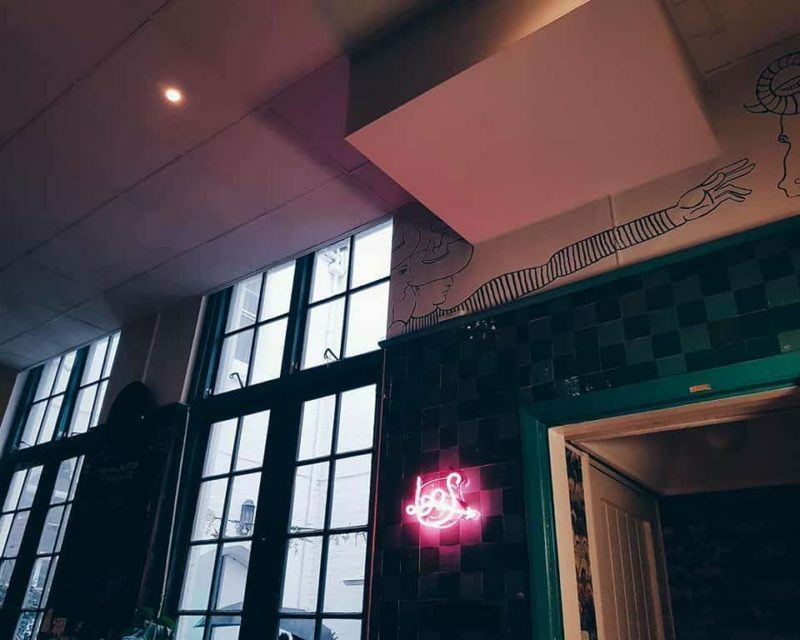 I was taken aback by the bright decor and wonderfully polite staff amidst the hustle and bustle of the cafe, the music was great and the staff attentive. So, what did I think of the Farm Girl cafe? The café offers a large room with plush and cosy furnishings inside, as well as a quaint outside seating area – ideal for those food snaps in natural light when the heavens are not open. The walls inside feature contrasting green square tiling and plush seating which gives off a fabulous natural and earthy vibe. You could really sit there for hours during the week sipping away. I chose their rose latte, a beautiful flavoured drink garnished with real rose petals. My partner opted for a vibrant blue butterfly matcha latte, taking us back to Japan as we discussed the possibility of a third trip. 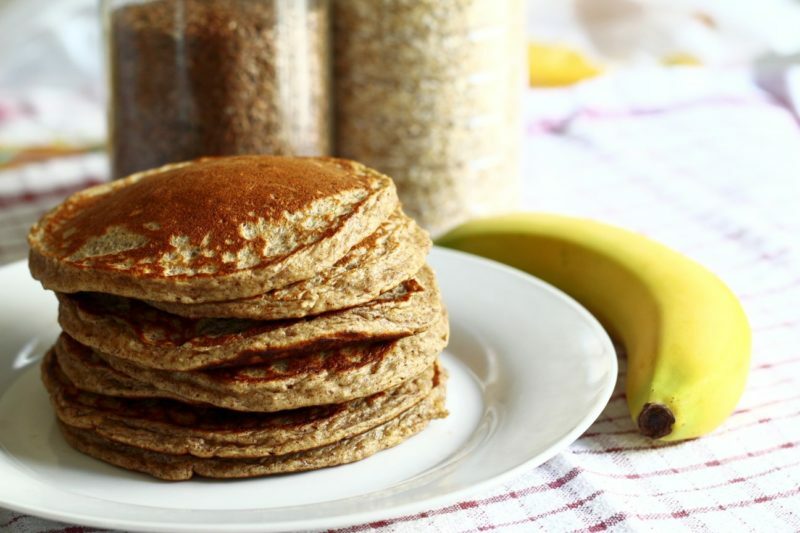 Farm Girl offers a healthy and wholesome menu, with breakfast and lunch covered. 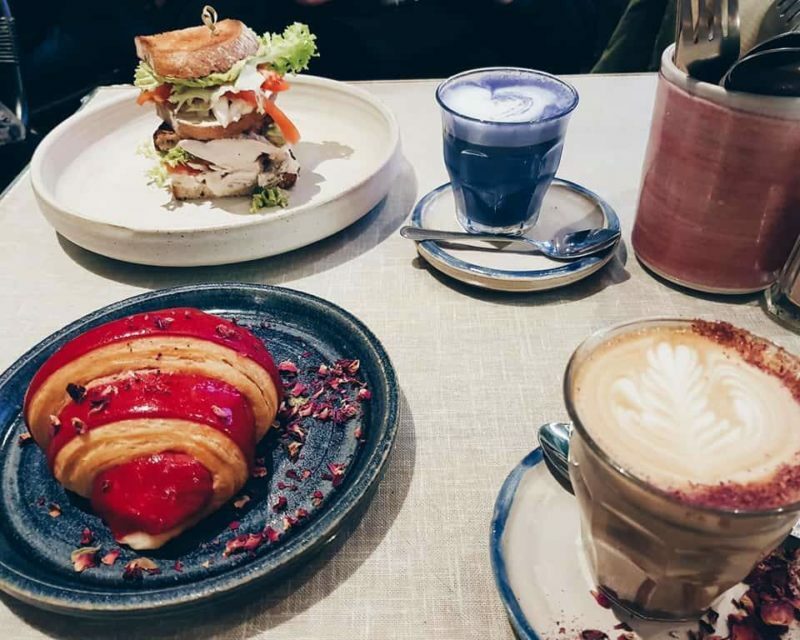 Think acai embellished fruit bowls, buckwheat pancakes, salads with all the colours of the rainbow, gargantuan sandwiches, eggs-just-the-way-you-like on toast and a variety of homemade soups to name a few items – oh, and the super colourful lattes. In regards to dining, I opted for a sweet treat, the raspberry croissant. My partner, a chicken sandwich, brimming with guacamole and spiced yoghurt on sourdough bread. If I was feeling a little more peckish, the Açai Bowl would have has my name on it. Maybe next time eh? 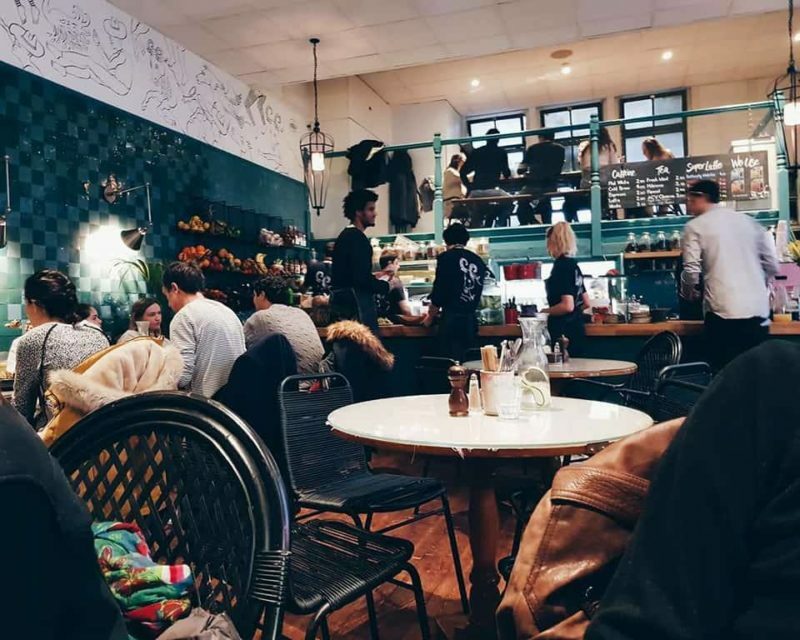 Overall, the Farm Girl cafe experience was lovely – the perfect pit-stop before exploring the delights of Portobello Market nearby. The afternoon date proved a little costlier than your standard chain cafés, a hot drink and cake for two will set you back about £15. Have you been to the Farm Girl Café? 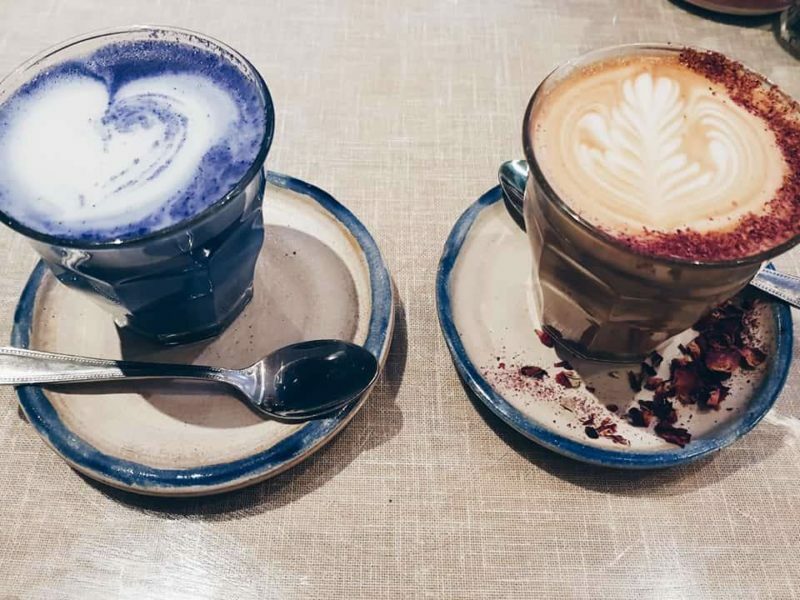 Which coloured latte tempts you? Degustabox has been on the scene for quite some time now and is growing in popularity – and for good reason. Weetabix Additions (apple and raisin), Propercorn sweet popcorn, Kallo organic stock pot (chicken), Taylors of Harrogate ground coffee (cacao superior Colombia), Dalston’s fizzy apple soda, ALO aloe vera drink, Planters fruity chocolate crunch, Cadbury Picnic Bites, Filippo Berio pesto, Filippo Berio crostini, Rio Mare tuna, The English Provender Co.’s caramelised red onion chutney, Ryvita multigrain rye cakes and The Jelly Bean Factory super sours. Planters Planters Peanuts Nut-Rition, Popchips galactic puffs, Taking The Pea snacks, Sleep Well vanilla milk drink, Marry Berry’s lemon and mustard seed vinaigrette, Coldpress valencian orange juice, Candy Kittens sour watermelon gourmet sweets, Robinsons fruit creations, Willie’s Cacao Black Pearls chocolate (dark sea salt caramel), Ryvita multigrain rye cakes (lightly salted), San Miguel 0.0% and Lift Matcha instant green tea. Clipper everyday organic tea sample, Robinsons fruit cordial, LighterLife Fast Ready to Drink shakes, Explore Cuisine edamame and mung bean fettuccine, Latin America Kitchen Colombian crunchy chicken corn coating, Latin America chipotle mayo topping, Hershey’s cookies and cream snack pack, Mahtay Yerba Mate sparkling tea, Pulsin vanilla whey protein powder, Pulsin vanilla choc chip protein booster bar, Jordans juicy red berry frusli bars, Wild Planet albacore wild tuna steaks, Miso Tasty spicy ramen noodle kit and Mallow & Marsh bar. So, what did I think of the Degustabox monthly subcription? 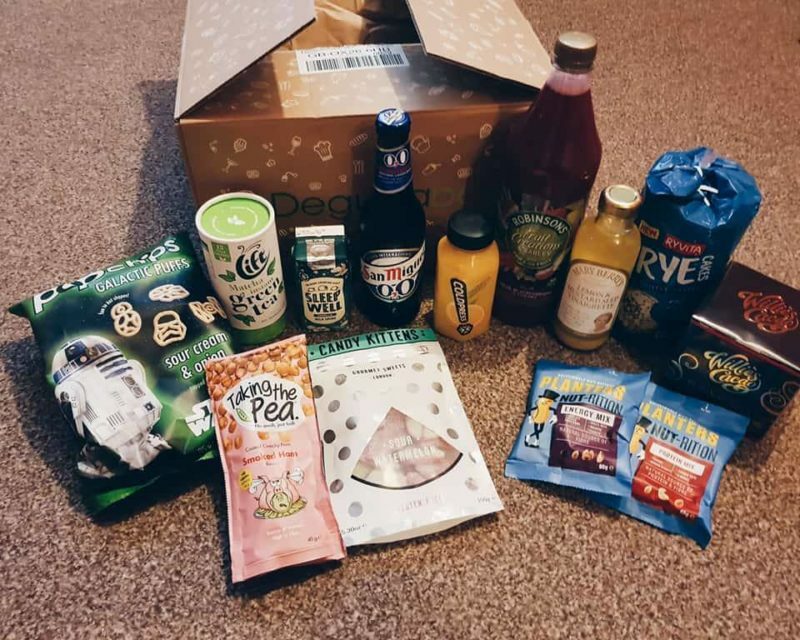 I was very pleased with my latest January box, it had a super healthy ‘New Year, new me’ theme and the varied items made for interesting snacks and dinners. I have to admit, I was not a big fan of the Mahtay Yerba Mate sparkling tea and the Pulsin vanilla choc chip protein booster bar – this did not put me off mind, the rest of the box was delicious. 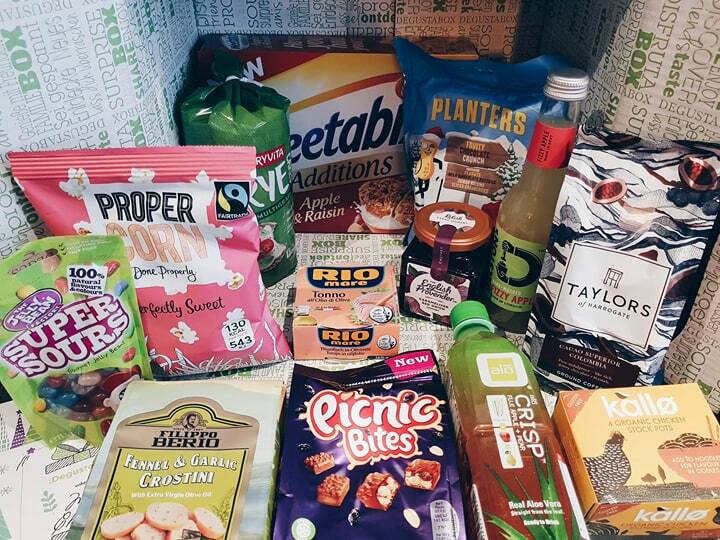 As you can see from the above months, Degustabox covers breakfast, additions for lunch or dinner, snacking, condiments, sweet treats, quirky drinks and other household essentials. They also include lots of handy tips and recipes to really brighten up your mealtimes. Each box contains 10 to 15 surprise products, with many being new to the market. Please note, I may have some additional items in my review boxes. 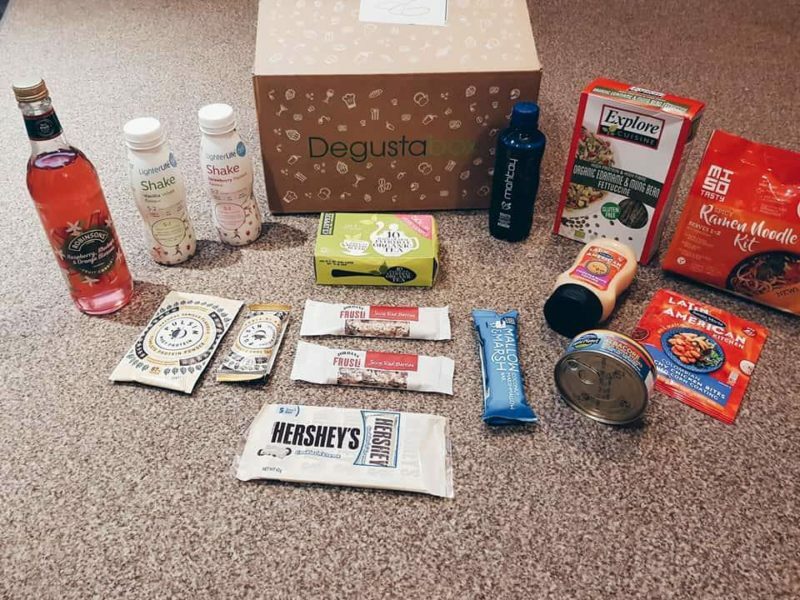 The Degustabox subscription is £12.99 monthly. However, if you use code 80O4C, you will receive an exclusive one time discount of £7, making your first box only £5.99! Handy eh? You can get your box here. What do you think of Degustabox? What would you like to see in a monthly food box? 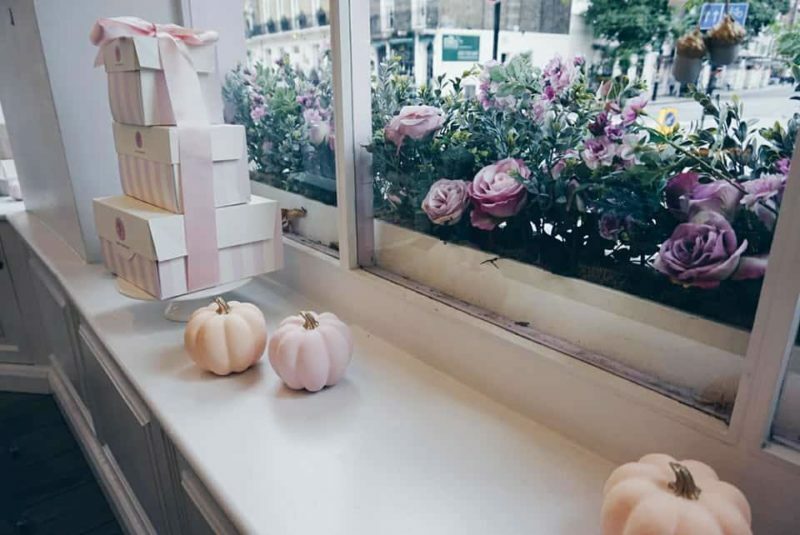 Peggy Porschen has had a rather enchanting Halloween makeover in the lead up to the best holiday of the year – in my opinion anyway, Halloween is fabulous. Still pretty and perfect in pink, the celebrated cake shop’s décor features some slight adjustments, with pastel pumpkins, cutesy bat bunting and sugar skull cookies aplenty temporarily garnishing its interior. 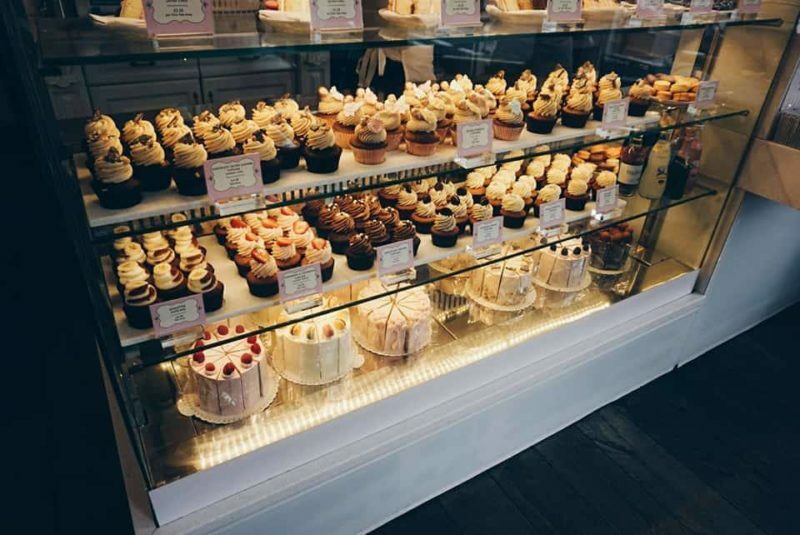 I paid a visit one morning to their quaint Belgravia bakery to sample some of the exciting new seasonal menu, absolutely delighted by the Halloween and Autumnal overhaul that welcomed me on arrival. 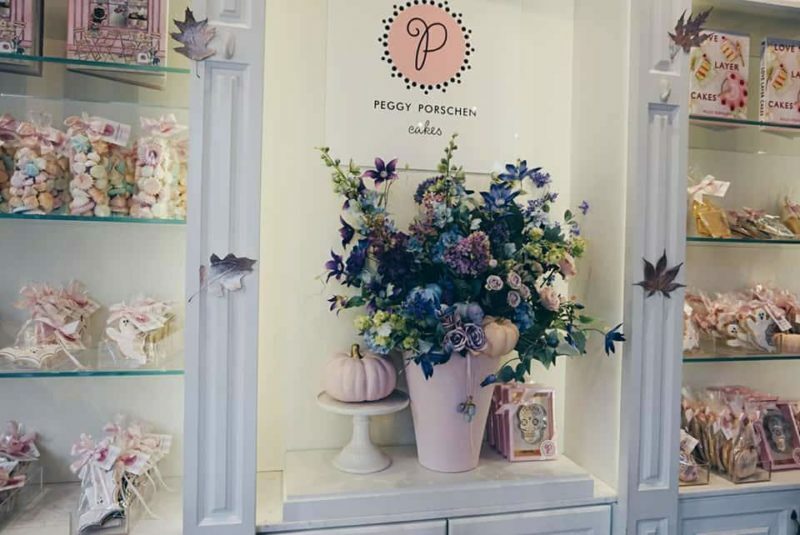 Peggy Porschen’s well-known floral garland door frame was emblazoned with pastel pumpkins, golden skulls and painted broomsticks, nestled amidst the beautiful and vibrant kaleidoscope of coloured flowers woven into the frame. Each table had its own munchkin pumpkin and the shop had the prettiest (not overly eerie in all honesty) and most welcoming feel as expected – can you even make somewhere so pretty in any way scary? 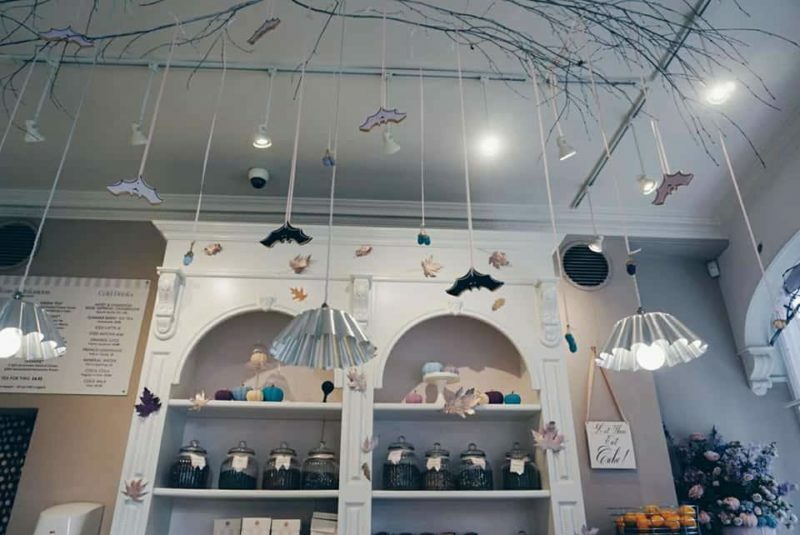 So, what did I think of the Peggy Porschen Halloween collection? Sitting inside, I chose a cappuccino which was embellished with cutesy sugar skull shaped topping and a spiced pumpkin cupcake. Although a tad on the expensive side, I must admit this handmade cupcake was delicious, with a fluffy spiced sponge and delicious cinnamon cream cheese frosting – which proved a little too indulgent in the end. 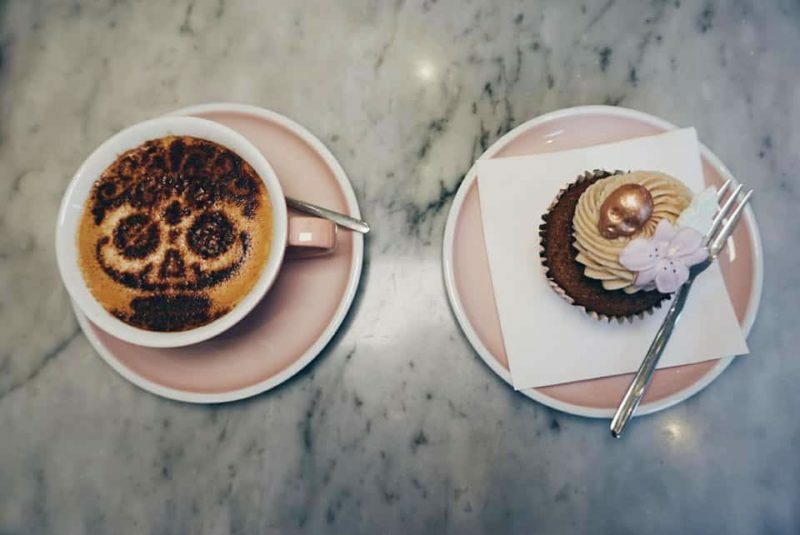 Peggy Porschen are known for their picturesque products and décor, and the Halloween spiced pumpkin cupcake was no exception, with an edible rose gold sugar skull with floral decal. Teamed with freshly brewed coffee, it is certainly a delicious morning or lunchtime pick-me-up – and is a fabulous date idea if you are looking for something a little different. 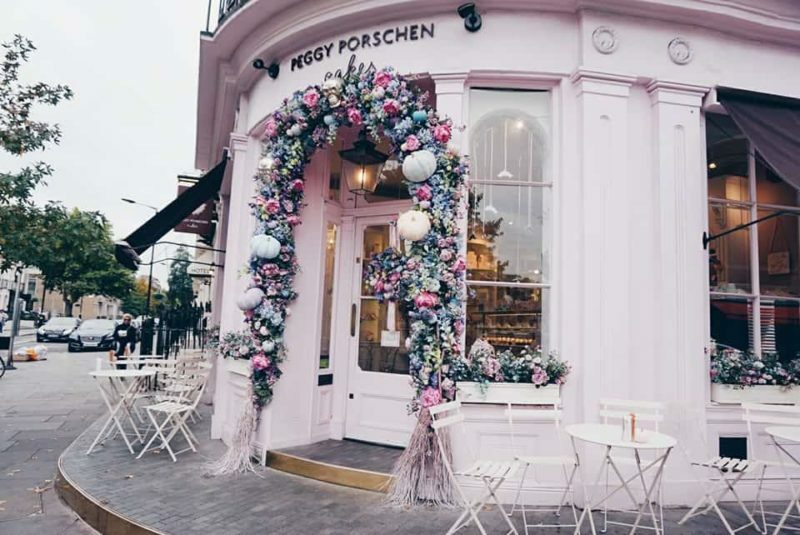 Have you been to Peggy Porschen yet? What do you think of the Halloween theme? 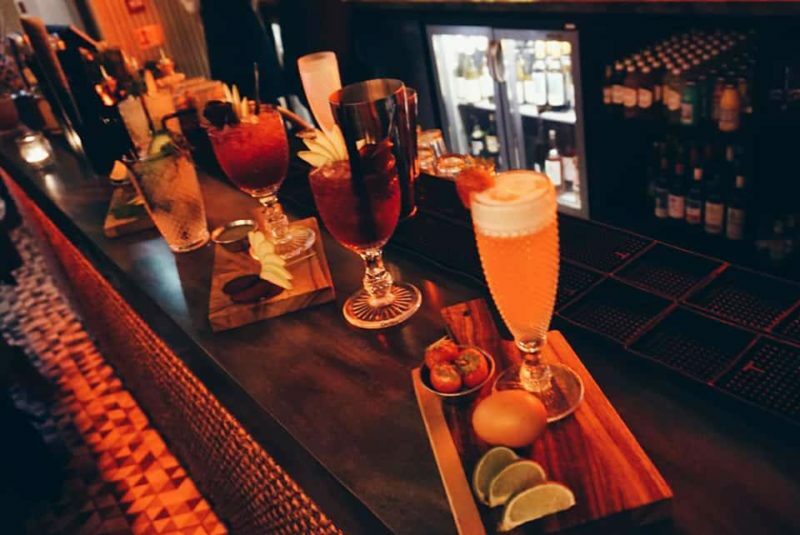 Exquisite cocktails in a beautiful bar in London? It is certainly a sought after affair after a busy week of work in the big smoke. TwoRuba ticks these boxes, a fantastic urban champagne and cocktail bar located on the ground floor of the Hilton London Tower Bridge. I have to admit, I was very excited when asked to come down and taste their Autumnal cocktail menu and sample some of their small plate dishes, with limited edition drinks and a cocktail masterclass being the highlight of the evening. 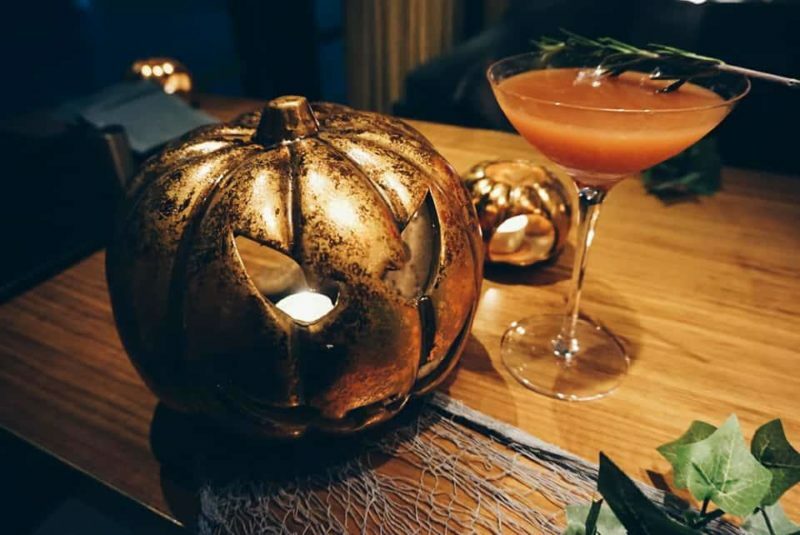 So, what did I think of the TwoRuba Autumn cocktails? After a glass of Prosecco and getting to know the other lovely girls and guys around me, we were offered the Scary Mary, a twist on the classic Bloody Mary with a warming kick. The Scary Mary offered a celery juice base and a hint of spice. I honestly thought it would be perfect after a night of cocktails, both refreshing and smooth. Next up, was the Autumn Lady, with a splash of gin and whisked egg white froth, emblazoned with brand logos or Halloween decal. Still with a slight kick – we need it with these chilly Autumn evenings. 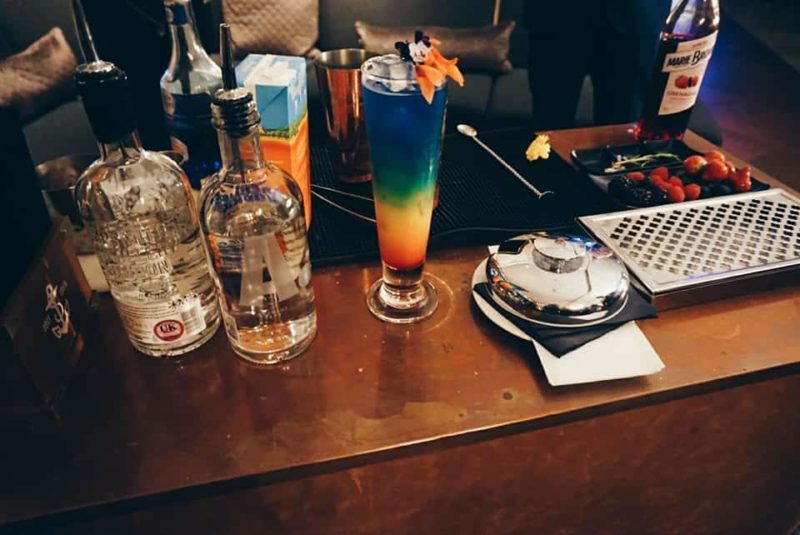 The highlight of the evening for many was the cocktail masterclass, where we were given a demonstration and then allowed to get stuck in and create our own take on the layered Rainbow Cocktail. I must admit, I was impressed with my final result (although, it was a tad heavy on the syrup) and the whole experience was a lot of fun. Swing by TwoRuba some evening after work and enjoy the spacious, relaxed and welcoming ambience, the cocktail bar is open each day from 7am to 1am (closing at midnight on a Sunday). Check out their drinks menu here. They are also getting in the festive spirit with their own TwoRuba by the pier pop-up on the lead up to Christmas. So, appreciate the London cityscape with views of Tower Bridge and the Thames and sip on mulled vine with an enchanting view. Have you been to TwoRuba yet? 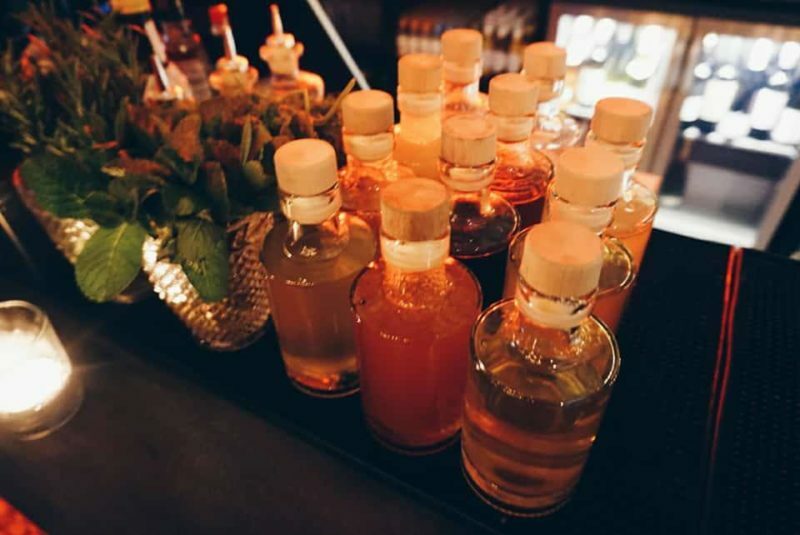 What is your go-to cocktail?